On the way to a great recipe, there are often a lot of disasters. I don’t usually highlight my recipe failures, however I decided to share my Vegan Molten Lava Cake recipe creation process with you. A lot of work goes into coming-up with one of my new recipes. It is rare that a recipe comes together on the first try, but it does happen from time to time; My PB Chocolate Chip Dessert Hummus was one of the rare exceptions in that I really liked the results of my first recipe version. The photo collage above tells the story of my first and second recipe attempts. Version one used flax eggs and almond flour as the base. I thought I would try to see if I could make this molten lava cake in the microwave and… let’s just say I got the “lava” part spot-on. I had some more batter left, so I tried baking it in the oven and it completely puffed-up only to deflate all the way back to the bottom of the ramekin. So, for version two I switched to using baking soda and vinegar eggs (I got the tip from Chef Chloe’s website) and added some more blanched almond flour. It looked so promising while baking, like a beautiful soufflé, and then TOTALLY deflated when I took it out of the oven. When I am in the middle of the recipe writing process I get a bit obsessive and tend to think about it constantly. After stewing about this for yet another day it came to me; everything started to make sense. I needed to take out some of the blanched almond flour, add in some gluten-free flour mix, a little xanthan gum, and some baking powder. Voilà, vegan and gluten-free Molten Lava Cake. That being said, isn’t it so true that those missteps make the successes all that more sweet? 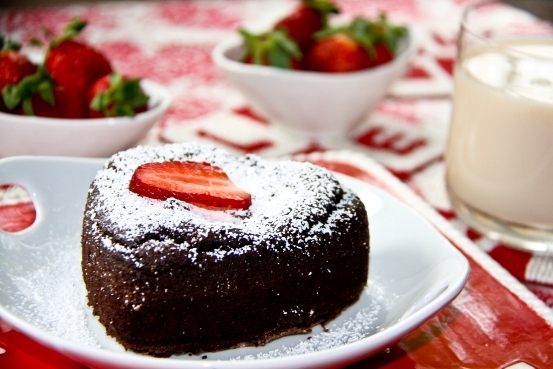 I set-out to create a molten lava cake that was vegan and gluten-free while also being easy on the waistline. I am really proud of this recipe. 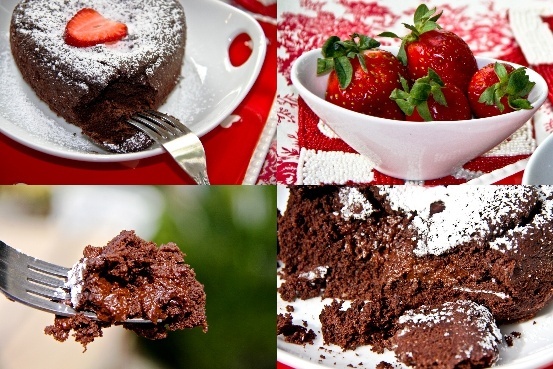 My honey LOVES molten lava cake and now I have a much healthier version to serve to him. Some people buy their men electronics or cologne for Valentines, I made mine a cake. 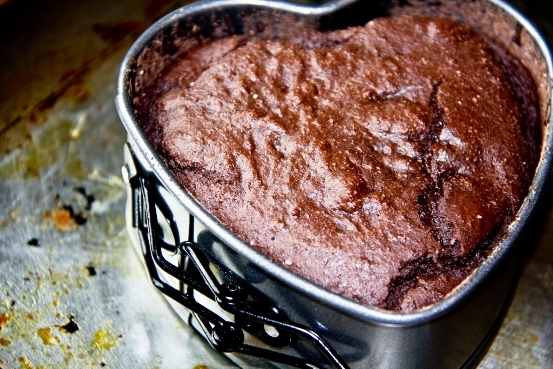 No doubt, this is one of the healthiest molten chocolate cakes I’ve ever seen! Bravo! The best part is that you would never know. It passed my husband’s test and he is a harsh critic when it comes to molten lava cake! Soooo wish this was nut free! Hmmmm. U could try subbing 1 1/2 Tbs gfree flour for the almond flour, but I haven’t tried that myself. The gfree flour isn’t as sweet as the almond flour, so I would also add one more stevia packet. Let me know if you try this and if it works. Fingers crossed. I really appreciate you sharing your process (it makes me feel a bit better regarding my own failed attempts at converting to vegan and GF–and there have been many!!). This looks amazing and virtually guilt free. Thank you! Wow! This is beautiful! I’d love for you to share it at allergy-free wednesdays http://www.realfoodallergyfree.com/2012/02/allergy-free-wednesday-28/ Hope to see you there! Well done, well done, well done! You should be proud! I know how frustrating recipe development can be–I still have some yet to be perfected after years of trials and errors! So this is amazing. I’m saving this for sure! 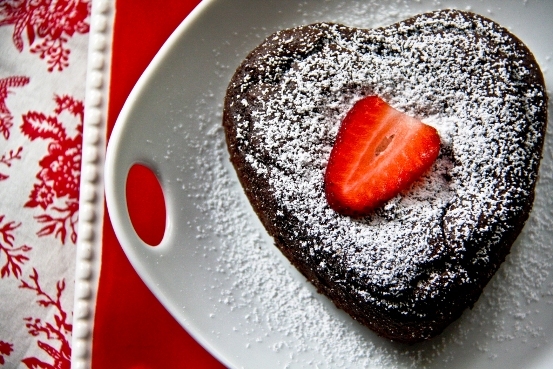 whats better than a perfect heart shaped molten lava cake:) i am sure your honey is all smiles right now! Looks great, I think I am going to try it. I am not a big fan of Stevia, do you think I could use regular sugar? Maybe 3 tablespoons? Sure, regular sugar should work just fine…taste test as you go and let me know how it turns out! This looks really lovely. I’m in Australia and have not seen Stevia in packets. We can buy it as liquid or in a small bottle as dry crystals. So what weight/measurement is 1 packet of stevia? Also, do you know what that would translate to in number of drops of the Stevia liquid? Any assistance/suggestions are greatly appreciated. I don’t know what the measurement is for the packets, but I am guessing that the liquid equivalent would be around 1/4 – 1/2 of a dropperful. 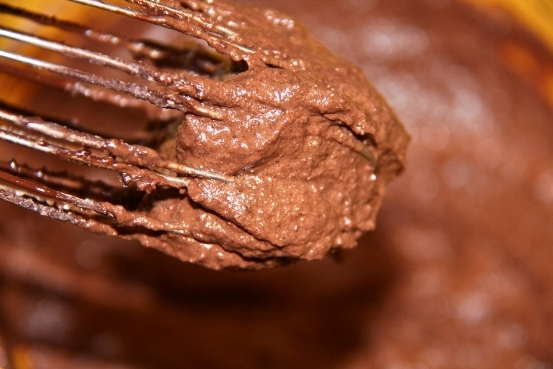 I would advise starting with 1/4 of a dropperful and tasting the batter. 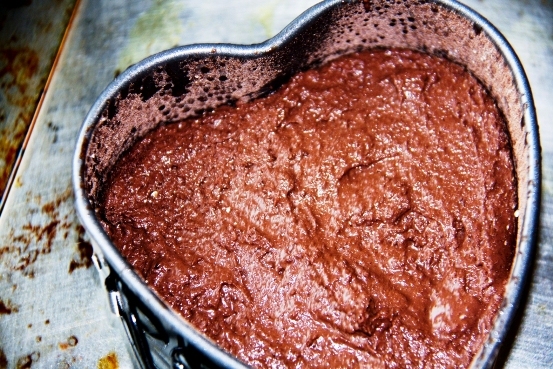 The batter should be sweet, but not very sweet since the sweetness tends to amplify when baked. Thanks for that info. I just googled ‘packets of stevia’ and the general thinking is that 1 packet of sweetener is usually equal to 2 tsp of sugar. Not sure if that is accurate in this case (perhaps is states it on the box somewhere?) but thought it worth passing on. I will be sure to let you kow how it all goes. Looks like all the trial and error was worth it in the end, the lava center of your cake is calling to me! I would use Sugar instead of the stevia packets! Can’t wait to share them with my man. I’m sure he’s going to love it! 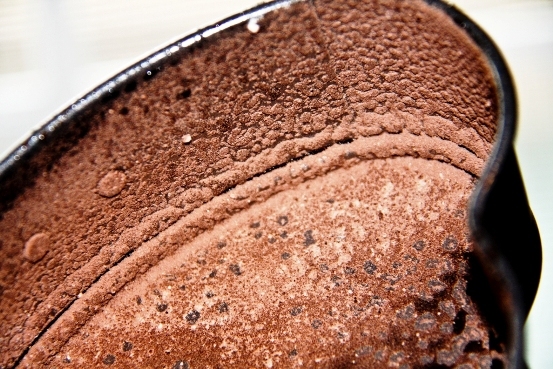 Let me know how it turns out with the carob chips…yum! Making this again. It turned out amazingly delicious. Even my chocolate loving boyfriend was obsessed. I think we gobbled this up in six bites (3 each). Totally decadent. trying this tonight for me and my boyfriends 5th month “anniversary” (haha)! he’s doing the dinner and i’ve got desert. 🙂 i’m slightly worried about finding the xanthum gum at a regular supermarket, though. Congrats on your anniversary! Call ahead to your grocery store to find out. I would recommend trying health food stores in the area too. Have fun tonight! Just a follow-up! It turns out the Red Mill brand in the vegan section of the grocery store had it! For reference, this was a Wegmans (east coast). I will e-mail the recipe to you. Sorry about that! I only have an eight inch pan, could i double the recipe? I’ve not tried it in a larger pan, but it should work. You will just have to play around with the cooking time (it will probably take a little longer to cook). Let me know how it works out.